In one of the draft’s smallest hauls in terms of total players, the Tennessee Titans selected great value across the board. 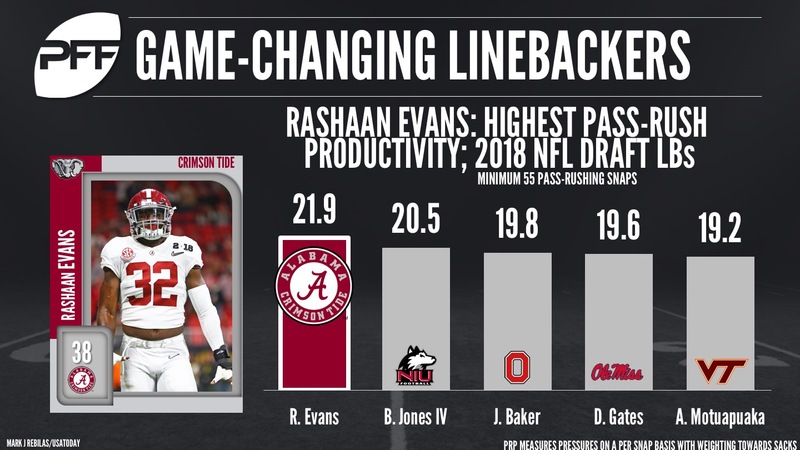 They were able to snag linebacker Rashaan Evans who fills a need in the middle of the field of the Titans defense. Evans was a pass-rushing nightmare for college opponents when he was tasked to do so. His question marks lie on whether he can improve in coverage where his best grade came in at a 76.6 grade. He has the speed and athletic ability to stay with running backs in coverage or has the moves to be a part of the Titans blitz packages on passing downs. Speaking of pass-rushing, the Titans selected incredible value in the second round by grabbing PFF’s top edge defender in Harold Landry. Hampered by injuries in 2017, Landry’s draft stock took a bit of a hit but his 2016 season and NFL combine workout showcased that he has all the tools to be a three-down edge defender at the NFL level. He can bend the edge like no other in the draft class and has the athleticism and burst to get off against even the most athletic tackles. Without a third- or fourth-round pick, Tennessee had to wait to select their next pick for 111 selections, taking Dane Cruikshank from Arizona in the fifth round. Cruikshank joins the Titans secondary after a strong performance against the run in 2017. He had a run-stop percentage of 6.2 last season, which ranked second in the draft class. Capping their draft with an exclamation point, the Titans drafted former Washington State quarterback Luke Falk with the 199th overall pick, the same position Tom Brady was selected with way back when. Falk is no Brady, of course, he still has shown off his accuracy and touch to the short and intermediate levels of the field despite coming off his worst season of his career with the Cougars.